Feel energized by the crisp tang of Flora’s apple cider vinegar wellness tonics, featuring three different complex flavour profiles. Drinking apple cider vinegar as a health tonic is centuries old. Luckily, these days, apple cider vinegars made for drinking are much more palatable. Flora’s daily wellness shots blend the tang of organic apple cider vinegar with the sweetness of organic apple juice, so they’re entirely drinkable! But the best part is that Flora has taken these apple cider vinegars to the next level. These wellness shots are like nothing else out there. They have managed to retain the benefits of the apple cider vinegar, including the mother culture and that wonderful warming sensation. But because Flora’s Wellness Shots are blended with herbal tea concentrate, the drinks don’t sting unlike straight apple cider vinegar. They won’t harm your tooth enamel either. 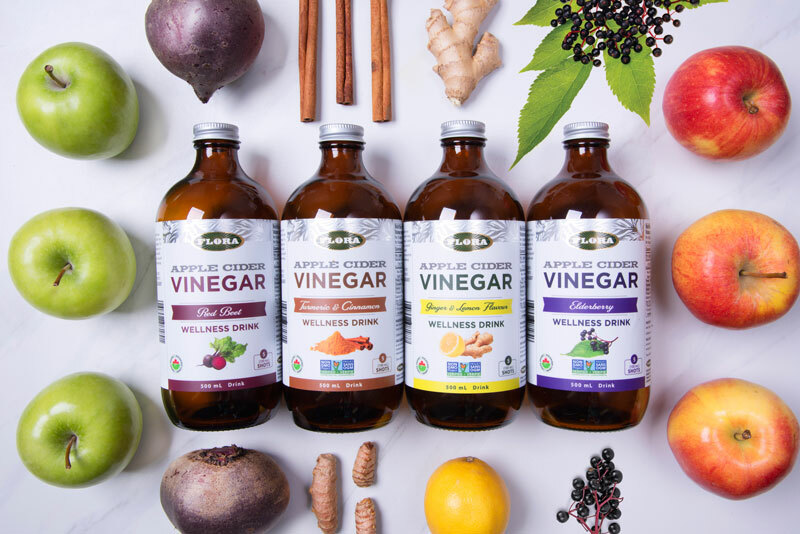 Flora’s apple cider vinegar drinks are unique—they are the only ones enhanced with detoxifying, immune-supporting and digestive-boosting ingredients. These special drinks not only contain delicious organic apple cider vinegar from a blend of Granny Smith, Fuji and Honey Crisp apples complete with the mother culture, they also contain seven of the cleansing, detoxifying herbs from Flor·Essence®, Flora’s famous full-body cleanse. In fact, there is a quarter dose of Flor·Essence® in every serving! Freshly ground organic herbs including sheep sorrel, red clover, blessed thistle, Turkish rhubarb, burdock, slippery elm, kelp and are water-extractedovernight, thenblended with organic apple cider vinegar and infused with flavour. Flora offers three unique blends: Elderberry, Ginger & Lemon Flavour, and Turmeric & Cinnamon. Enjoy the crisp tang of apple cider vinegar paired with an enticing combination of cinnamon and turmeric. The complex, earthytones of cinnamon balance with the spice of turmeric, creating a robust wellness drink that will both refresh you and support healthy digestion (turmeric, cinnamon).